WRITING ON THE WALL Power Of The Picts (Astor) Australia 1969. Here's an Ultra Rare!! 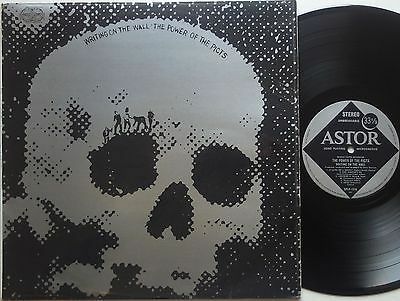 Original Australian 60s Pressing of "Power Of The Picts" by Writing On The Wall. Fantastic Scottish Heavy PSYCH Rock. These Astor Pressings play Great and better than the UK Middle Earth Presses..in my experience. The Vinyl is really nice..and appears seldom played. The Cover is VG+ (see pics and zoom), minor tape on the front and rear, ringware/rubbing on the reverse, the Vinyl is Near Mint..some very faint sleeve scuffing, but nice and glossy..appears seldom played. Plays Great!! Extremely difficult to find, don't miss out! !